This audio anthology continues the long and distinguished relationship between poetry and baseball. AHOB friend Michael C Ford, a Pulitzer Prize nominee for his Emergency Exits: Selected Poems 1970-1995, scoured the sandlots of Southern California to compile a stellar lineup of heavy-hitting and rubber-armed literary figures, eager to take their swings and toss some metaphors for the newest team on the sporting scene, the Los Angeles Bards. 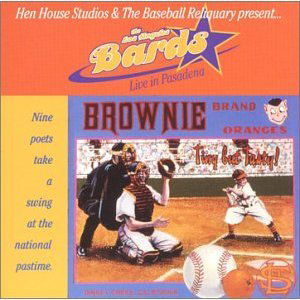 The CD includes approximately 45 minutes of material from the Bards’ inaugural game, sponsored by the Baseball Reliquary and played on August 25, 2002 at the Donald R. Wright Auditorium of the Pasadena Central Library, Pasadena, California. Featured poets include Harry E. Northup, Joel Lipman, Philomene Long, Fred Voss, Chef Guillaume, Joan Jobe Smith, Eloise Klein Healy, Gerald Locklin, and Michael C Ford. As with everything in the marketplace, 100% of the proceeds help defray medical expenses for Tucker and help support his artwork.